Citation: C N Trueman "V1"
historylearningsite.co.uk. The History Learning Site, 25 May 2015. 9 Apr 2019. The V1 was one of Hitler’s secret weapons that he had told his generals that Nazi Germany possessed which would turn the way World War Two was going in 1944. The V1 was first launched against Britain in June 1944, just one week after D-Day. The V1 is difficult to classify as a weapon as it was not a true rocket in that it did not leave the atmosphere, but it was also clearly not a plane. 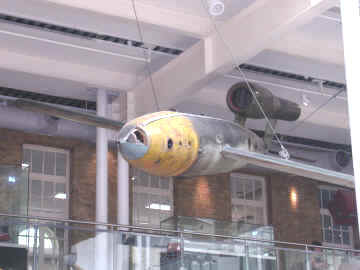 Perhaps it could best be described as a winged but pilot-less fuel propelled flying bomb. “The Chief-of-Staff feel that you should be made aware of reports of German experiments with long-range rockets. The fact that five reports have been received since the end of 1942 indicates a foundation of fact even if details are inaccurate…no time should be lost in establishing the facts and in devising counter-measures….suggest you should appoint one man..…Mr. Duncan Sandys to direct investigations. It is not considered desirable to inform the public at this stage, when the evidence is so intangible.”General Ismay. Churchill took on board the memo and appointed Sandys to lead investigations. Sandys soon provided Churchill with reports that Germany had been carrying experiments with heavy rockets, jet-propelled planes and airborne rocket torpedoes at Peenemünde on the German Baltic coast. More establishments had been identified in northern France. In June 1943, Sandys informed Churchill that intelligence was finding out more about large rockets that flying bombs. He advised Churchill to order Bomber Command to attack the base at Peenemünde as soon as possible. Such was the fear at government level regarding these findings, that the Home Office once again went through the motions of organising the evacuation of children and pregnant women. More Morrison shelters, last seen in the Blitz, were also moved to London. Information about Hitler’s secret weapons came from a number of sources. An eagle-eyed WAAF Flight -Officer, Constance Babington-Smith, spotted on a reconnaissance photo a tiny aircraft on a ramp and a set of rails at Peenemünde. It seemed to be pointlessly aimed out to sea. In France an agent called Michel Hollard investigated a large concrete construction being built by the Germans near Rouen. He actually got a job there himself and saw a ramp being built that was in the general direction of London. Hollard cycled around other parts of northern France and found similar structures being built. He even got plans for one of the sites at Bois Carré. On August 17th 1943, Bomber Command launched a raid on Peenemünde which destroyed many of the assembly shops and laboratories there and killed a number of high ranking scientists – including Chamier-Glisezenski, the chief scientist. Nearly 600 bombers took part in this raid – with 41 shot down. Ironically, the success of the raid forced the Germans to move their work to the Harz Mountains where work was carried on inside the mountain itself which made an attack by bombers impossible. Test flights took place in Poland. At the end of December 1943, Air Marshall Bottomley, Deputy Chief of the Air Staff, reported that 69 ‘ski’ ramps had been identified in northern Europe. Those in the Pays-de-Calais and Somme-Seine were targeted at London while those in the Cherbourg area were seemingly targeted at Bristol. Between January 1944 and June 12th 1944, over 2000 tons of bombs had been dropped on the identified sites – either by high flying bombers or by modified Spitfires and Hurricanes carrying 500lb bombs. In fact, these raids proved of little value as the Germans were quick to rebuild the sites but also to carefully camouflage them. Any damage done was quickly repaired. The Germans created a special unit to handle the flying bombs – the 155th Flakregiment commanded by Colonel Wachtel. The V1 – officially for the Germans the FZG-76 – was also known as the ‘doodle bug’, ‘buzz-bomb’ and ‘cherry stone’. It was 25 feet long and had a wing span of 16 feet. Loaded with fuel, it weighed 2 tons and it had a warhead of 2,000 lbs of explosives. The most common way of launching the V1 was by ramp. It could also be launched by a modified Heinkel III. Originally, the V1 had a maximum range of 150 miles but this was improved to 250 miles to allow for it to be launched from Holland. About 10,500 were launched at Britain from June 1944 on, 8,800 by ramp and the rest by plane. The first one was first on June 13th 1944. At about 04.15 on the morning of June 13th, a member of the Royal Observer Corps (ROC) in Kent saw what he described as a bright yellow glow in the dark, coming from the engine at the back of the V1. The ROC had already been told to look out for such things and the ROC lookout immediately informed his superiors with the code-word “diver”. The engine of this V1 cut out over Kent and it fell 20 miles to the east of the Tower of London on the village of Swanscombe. Very shortly, others fell on Cuckfield, West Sussex, Bethnal Green, London and Sevenoaks in Kent. The only deaths were six people killed in Bethnal Green. On June 13th, ten V1’s were fired at London but only four got through. Four crashed on take-off (confirming what Wachtel had feared, that they were not fully ready for use) and two crashed into the English Channel. If all of the sites in northern France had been fully operational, then nearly 300 V1’s may well have fallen on south-east England. Wachtel was given strict instructions by his commanding officer, Lieutenant-General Erich Heinemann, to get all the sites working as soon as was possible. Though the V1’s had no impact on the success or otherwise of D-Day, they did present a serious threat to London and south-east England. The defence of London rested with fighter planes, anti-aircraft fire around the coast and the use of barrage balloons. Any destruction or interception of the V1’s had to be done outside of London as any that were destroyed over London itself, may well have exploded on contact with the ground – thus doing what the V1 was intended to do regardless. One major success that the British had was finding out the height at which the V1 flew – between 2000 and 3000 feet. The top speed of the V1 was also worked out – between 340 mph to 400 mph when it approached its target. The man put in charge of defending London – Air Marshall Roderic Hill – had a number of fighter planes at his disposal which were faster than the V1’s and could fly above the weapon before descending to attack it. The Spitfire XIV, the Mustang III, the Tempest V and the Mosquito could all do this – but they had a relatively small amount of time to do their work in. On June 15th, 244 V1’s were launched from 55 sites. 73 hit Greater London and 71 hit areas outside of London. 100 V1’s failed to get across the Channel. It was the start of a major offensive. On June 17th, Hitler flew to northern France to congratulate Wachtel and he ordered that all the ‘cherry stones’ (Hitler’s nickname for the V1) should be targeted at London and nowhere else. On June 18th, one V1 hit the Guard’s Chapel at Wellington barracks and killed 121 people and wounded 68 others. London was about to experience another terror. By the end of June 18th, 500 V1’s had been fired in total. Churchill asked Eisenhower to do what he could to attack the V1 bases in northern France as part of the Allied advance across the region after D-Day. 617 ‘Dambuster‘ Squadron attacked sites with ‘tallboy’ bombs (12,000 lbs bombs) but by June 29th, 2,000 V1’s had been launched at London. In London, a decision was taken about the city’s defence. Anti-aircraft guns were moved to the coast. Here they would have an unrestricted field of fire. Radar experts also believed that their equipment would work better nearer the sea away from buildings. Nearly 800 anti-aircraft guns were moved to the coast and 1,000 barrage balloons were erected. Fighter pilots also learned new tricks to destroy V1’s such as flying alongside the weapon and tipping over one of its wings, thus knocking it off course. Pilots also flew in front of a V1 so that it flew in the fighter plane’s slipstream. This was enough to unbalance the V1 so that it flew off course. However, many V1’s got through. By July 5th, 2,500 people had been killed and even the Air Ministry in the Strand had been hit with 198 people being killed in that attack. By July 19th, 1,600 guns were in place around the coast. Hundreds more barrage balloons had been put up but many V1’s still got through – though more and more were being destroyed before they reached London. However, it did seem that the tide had turned in favour of the defenders of London. But London was to face an even more terrifying weapon – one that could not be seen or defended against – the V2.